Everyone has their favorite when it comes to Edgar Wright and Simon Pegg's comedy trilogy of Shaun of the Dead, Hot Fuzz and The World's End. I couldn't pick one until I saw all three which left me only Hot Fuzz. 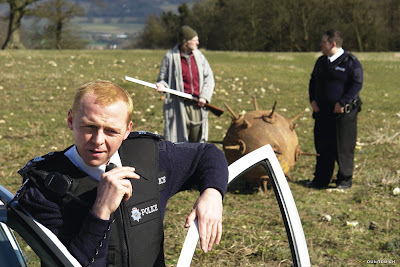 Hot Fuzz in some ways is quite different from the other two. Simon's character as Officer Nicholas Angel to be exact is not the slacker that he is in Shaun of the Dead or buffoon in The World's End. He's a gun ho, by the book cop that situations around him in contrast to his serious demeanor makes this a good comedy. We meet Nicholas Angel in the beginning of the movie, who excels in his job so well that his superiors decides to have him transferred to the country side because they look so incompetent in comparison to him. It's in his new town of Sandford that he meets his partner, whom he takes for a local drunk the first night that he's there. His partner, Danny Butterman played by Nick Frost is also the son of the Head of Sandford's police department Frank Butterman. Nicholas is a fish out of water compared to his fellow officers who are much more laid back in a town with supposedly no serious crime in over a decade. Along with the complacent police force, there is a neighborhood watch alliance which the local supermarket owner Simon Skinner played by Timothy Dalton is a part of. The groups though are more concerned with a street performer, a runaway swan, and teenage graffiti artists due to the low crime rate and the annual Village of the Year award they hope to win. Nicholas though learns that every thing is not what it seems as a series of murders deemed accidents by his colleagues pop up all over town. As the two partners grow closer after bonding by watching the cop flick Point Break, things start to unravel for the town. It's the absurdness of this whodunit that makes up most of the laughs of the film. Overall, I would recommend this to fans of Wright, Pegg and Frost. However, to answer my earlier question, is this the best of the Three Flavours Cornetto Trilogy? Personally, I would rate this last. It's not bad and quite humorous in a lot of parts. But the laugh out loud component is just not there compared to the other two. None of the characters really stand out in their roles. With my favorite scene being early on when Nicholas talks to his supervisors. 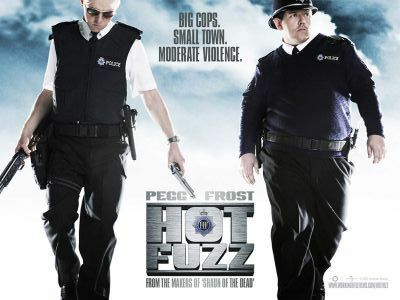 What did you think of Hot Fuzz? Robert Popper as "Not Janine"